Borneo in Southeast Asia is home to some of the most pristine rainforests on earth. Weve listed five of the best rainforests in Borneo and how you can travel there. Borneo is home to some of the richest rainforests left on earth. Here are five of the most pristine rainforests and how you can get there. Even in the modern world, there are pristine expanses of wilderness to be found. Borneo is home to some of the last great rainforests on earth. The island is shared between three countries—Malaysia, Indonesia, and Brunei—and is home to 6 percent of the world’s biodiversity. As many species are endemic to the island, you need to go there to see them for yourself. 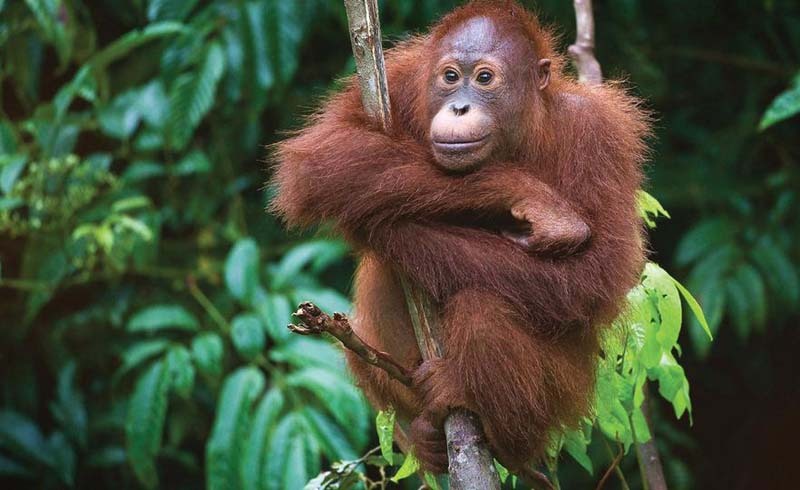 If you’re lucky, you might spot Bornean orangutans, proboscis monkeys, or pygmy elephants. Regardless of which creatures you see, prepare to be dazzled by the rare wildlife Borneo’s rainforests have to offer in any of these idyllic destinations. The Kinabatangan River is a cloudy, low-slung river that winds through the Malaysian state of Sabah. The riverbanks are teeming with wildlife, particularly in the misty morning hours. Rise early to explore the river by boat. Along the way, you might see pygmy elephants, crocodiles, or proboscis monkeys leaping from tree to tree. By night, a new cast of characters takes the stage. Set out on a guided night trek to see nocturnal creatures like the slow loris or the tiny western tarsier. The Kinabatangan River is a two-hour drive from the airport in Sandakan. Book two or three nights in an all-inclusive lodge for plenty of chances to see the local creatures. Located in the center of Sabah, the Danum Valley is laid out over 150 square miles of lush forest. The spectrum of wildlife lives here includes orangutans, bearded pigs, gibbons, pygmy elephants, and medium-sized cats—such as leopards and bay cats. Although scientists primarily use this park, there are two lodges open to travellers. Because accommodations are limited, it’s essential to book your travel far in advance. As Danum Valley is quite rainy, bring along a durable weatherproof pack. The park is accessible via flight to Lahad Datu from Kota Kinabalu. Bako National Park is less than an hour from downtown Kuching, but it still feels wonderfully wild. The park spans ten square miles of stunning landscapes, including mangrove trees, swimming holes, sandy beaches, and lush forests. The main draw, however, is the thriving population of proboscis monkeys, who become particularly boisterous at dusk. There are also beaded pigs, long-tailed macaque monkeys, silver leaf monkeys, and fascinating flora like pitcher plants. It’s possible to visit on a day trip, but that means you’ll miss the animals at their most active. It’s best to stay overnight, so bring a comfortable backpack that is light enough for hiking. Brunei is a tiny, wealthy country carved out of the Malaysian state of Sarawak. Because the country made its money in oil, Brunei hasn’t cut down its rainforests to make way for palm oil plantations. As such, forests cover approximately 70 percent of the country.. Ulu Temburong National Park is one of these. The park is mostly reserved for scientists, but the one square mile that is open to tourists is incredibly lush. Visitors can take canopy walks, hike through the jungle, and swim in the waters of the Sungai Temburong. Approximately 73 percent of Borneo is located on Indonesian territory. There is great beauty on the Indonesian side, but the sites are more difficult to access than the parks in Malaysia. One national park worth the effort is Tanjung Puting National Park. 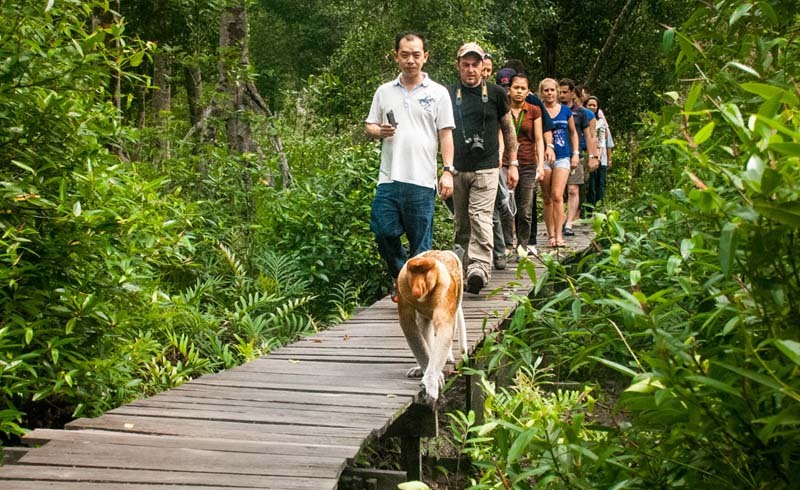 The park is home to a renowned orangutan rehabilitation site named Camp Leakey. Here, orangutans that were held in captivity are able to roam freely. For that reason, sightings are practically guaranteed. You’ll want to have your camera on hand, so bring along a packable waistpack to keep it close. Tanjung Puting National Park is accessible via flight from Jakarta to Pangkalan Bun's Iskandar airport. Plan your trip to Borneo between March and October, during the dry season. No matter when you go, the forest is abuzz with life.